Well, not with my $150 billion you’re not. A few days ago, W asked congress for $10.5 billion. Now he’s gone back for another $51.8 billion. Where do they come up with these numbers? Is the .5 or the .8 really a necessary and integral part of the request? Have they got it down to those fine details or is it all a smoke-screen because asking for $10 billion or $50 billion sounds too general, somehow fiscally ambiguous? Trent Lott, the guy with the wrecked house and the lousy toupe is the same Trent Lott who, as a United States Senator, got the Deputy Assistant Army Secretary relieved of his duties as issuer of Gulf Coast permitting issues. He tried to get him fired. Didn't work. Michael Davis, the deputy, was guilty of trying to stop the Army Corps of Engineers from approving every casino application that came along. And there were a bunch of them . . . twenty at least on the Louisiana coast alone. All twenty are now in the drink, along with Trent Lott’s house and the 16,000 jobs that went along with the slot machines. Our forward-looking federal government builds bridges to undevelopable barrier islands so profit-looking developers (with the help of their local Trent Lott variant) can asphalt them over. Selling off the gulf views without assessing the gulf storms is profitable business and enough pale northerners show up between and betwixt major hurricanes to sign on the dotted lines. Nature trumps the Army Corps of Engineers every time and nature’s way of mitigating coastal hurricanes is to build deltas and coastal marshes. Instead, the COE dikes and dams the river, drains coastal wetlands (25 square miles a year on the Mississippi alone), paves over and extends. Those who criticize that policy bear the wrath of the Trent Lotts and other coastal politicians. With this hind-sight, W’s braggart expectation of sitting on Trent’s porch makes little sense. Not with my $150 billion isn’t a statement of unwillingness to rebuild when and where rebuilding makes sense. But it is a recognition that the cycle of build and wreck, build and wreck . . . all with federal subsidies, is just nonsense. Jane Bullock, Clinton’s chief of staff at FEMA, said there are two kinds of levees, those that have failed and those that will fail. As I write this, no less than three glitz-buildings are approved for Biloxi and Gulfport. 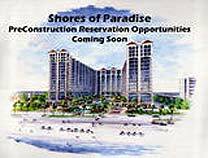 The Shores of Paradise, planned for Biloxi is pictured on the left. No doubt Trent will come roaring out of his Washington office in support of this project like a force-5 hurricane. And when it’s built, when the developer retires to his plantation (located well inland) and the next big storm hits . . .
. . . the government check will be in the mail. Drawn against your and my account. Just saw your post on MCI from a few months back... MCI stands for Microwave Communications, Inc. Was started by a couple of truckers in the late 60's that got tired of paying so much for long distance. We're not half the company we used to be, merger or no.